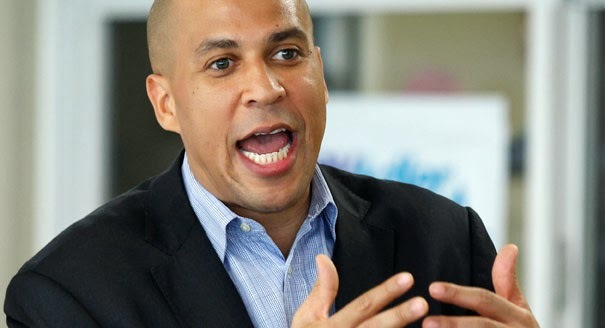 The Urban Politico: Cory Booker is Headed to the United States Senate! Cory Booker is Headed to the United States Senate! Newark Mayor Cory Booker, a rising national Democratic star, was elected to the U.S. Senate Wednesday and will become New Jersey's first ever African American senator. Booker defeated Republican Steve Lonegan, a former mayor of Bogota. With 58 percent of the vote counted, the Associated Press called the contest for Booker, who was carrying 56 percent of the vote. When Booker is sworn in, the Democratic Caucus will once again hold a 55-45 advantage over the GOP Conference. Booker will fill the seat once held by Frank Lautenberg, a long-serving Democratic senator who died in June. Gov. Chris Christie appointed fellow Republican Jeff Chiesa to be Lautenberg's interim replacement. Booker, 44, will become the chamber's second African American member along with Sen. Tim Scott (R-S.C.). The Democrat will enter the Senate having already achieved celebrity status. A regular on cable news programs and Sunday morning news shows with more than 1.4 million followers on Twitter, Booker has cultivated a profile that extends well beyond New Jersey. He could fill a void in the Senate. While there are a handful of freshman Republican senators with growing national profiles like Sens. Ted Cruz (Tex. ), Rand Paul (Ky.) and Marco Rubio (Fla.), there is a dearth of new Democratic senators eager for a spotlight.